Best Natural Herbal Foot Care Cream. Repair Severe Dry Cracked Feet & Heels. Reduce Itchy Hands and Feet & Athletic Foot Odor. Foot Odor Natural Remedies. Safflower Oil, Petrolatum, Glyceryl Stearate PEG, Sorbitol, Aloe-Vera, Menthol, Paraguay TEA, Rose Hips Oil, Allantoin, VitaminE, Fragance, Peppermint, FD&C Blue #1, FD&C Yellow #5. Having Problems with Dry Cracked Heels & Skin? With Unpleasant Odor or Itchy Feet? This doctor-formulated all natural herbal foot care cream and remedy helps moisturize, rejuvenate, repair, and heal your dry cracked feet, heels, and scaly skin. This effective topical treatment and rejuvenating foot cream also provides the fast acting natural healing for your tired feet and legs. Vittaci Best Natural Herbal Foot Cream Can Help! Get Fast Rejuvenation for Your Scaly Feet in 30 Minutes! Instantly relieve itchy feet & heels the very first time you use it. This best cracked feet & heel relief cream contains potent nutrients & herbs that promote the natural healing of cracked & scaly skin so that women can show off their beautiful & smooth skin in the latest fashion footwear. Do not waste your money on other foot renewal cream that has minimal effectiveness. Vittaci Foot Cream is guaranteed to help repair your severe dry cracked feet & heels, heal your foot pain, reduce & cure foot odor, relieve itchy feet and rejuvenate your tired leg and foot or you get your money back! This best & effective day-time and night-time foot renewal cream is formulated and manufactured under the direction of a talented physician dedicated to finding viable herbal treatment & natural healing to your scaly heels, smelly / itchy feet, and tired legs & feet. It's also an effective anti-itch natural formula. After years of research and development, this doctor finally completed and provided us with an outstanding and revolutionary miracle foot skin remedy that will heal cracked skin and reduce smelly athletic foot. The best combination of Nature & Science! Vittaci Foot Cream features a balanced approach of world-renowned Aloe Vera, Safflower Oil, Paraguay TEA, Peppermint & Vitamin E that provides deep-penetrating and moisturizing effects on your damaged skin, It also provides temporary relief for odor & itching. This top natural foot cream keeps the roughest skin on your feet smooth, soft and healthy and accelerates the restoration of the skin's natural moisture balance. It can also be used on minor cracks on hands & elbows. In the process of research and development, Dr. Tran has employed various technologies to ensure that Vittaci Foot Cream will provide fast acting and effective relief of your scaly skin. Vittaci cracked heel cream applies advanced absorption techniques and latest-researched ingredients to ensure that high concentration of effective ingredients will be quickly absorbed into the skin to help repair your cracked heel and feet. Our technology will maintain or increase hydration of the outer layer of the skin to promoter greater nutrient absorption. Vittaci Foot Cream is specially formulated to smooth, soften, and rejuvenate your tired feet. This natural cream also promotes the healing of dry cracked skin. Aloe Vera is a source of polysaccharides that are naturally found in the skin. Aloe allows the skin to maximize the absorption and utilization of necessary nutrients which cleans dry skin and reduces itching. Furthermore, enzyme-active Aloe Vera neutralizes odor-causing bacteria and athlete's foot fungus. Paraguay TEA has the highest natural source of theophylline that is used to help firm and tone the skin. It helps reduce skin conditions associated with irritation and sunburn. Furthermore, Paraguay is a natural source of xanthines which also helps minimize redness and irritation caused by over exposure to the sun. Peppermint in our foot cream is an anti-bacterial herb with strong anti-septic properties. It also has cooling and refreshing properties. Allantoin is derived from the Comfrey plant and has been use as a healing agent for centuries. Vitamin E penetrates and nourishes skin cells through the enzyme-active Aloe. Recommended Use: For best result, use after bath and before bedtime. 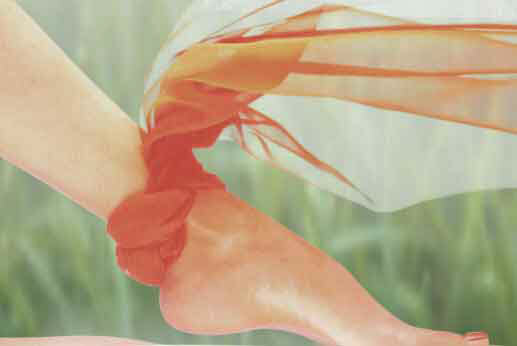 Clean feet with soap and warm water & dry feet prior to applying foot cream. Rub thoroughly until the cream is fully absorbed. We are certain that this high quality & potent formula will provide the desired results. If, for any reason, you are not 100% satisfied, simply return the empty bottle or unused portion within 30 days we will promptly refund the purchased price with no questions asked (excluding shipping/handling).